This month’s update includes new features across all areas of the product – new dashboard and report authoring features, and more dashboard controls. Some of these features address frequent customer requests — so you may really enjoy this update. You can now pin entire report pages to your dashboard. To do this, simply open a report page and select Pin Live Page in the top navigation bar. You can pin more than one report page onto a single dashboard. Pinning report pages provides an easy way of reusing existing reports as dashboard content. When there is only one report tile on the dashboard, the dashboard is essentially the report. 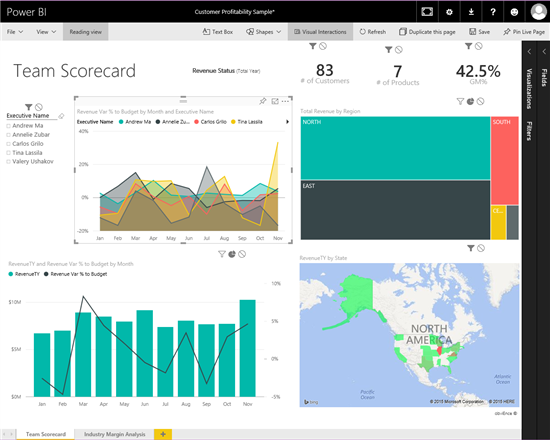 You may find it particularly helpful when migrating a large number of reports from Power BI for O365 to Power BI service. Instead of pinning the charts and tables from your report one by one, you can simply pin the whole report page to your dashboard. And the visuals within the tile stay in sync with the report. If you change a visual type (e.g. from a pie chart to a treemap), or the report filter state changes after pinning the report, the changes get updated on the report tile automatically. 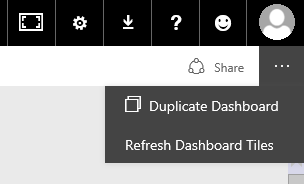 No need to delete the old report tile and re-pin it. Decide whether to pin the tile to an existing dashboard or to a new dashboard. Once pinned, the tile can be resized, renamed, moved, and edited just like other tiles. The pinned tile has the same layout as the report page. You can interact with all the visuals in the report tile just as you would on the report page. In addition, you can use the slicers to filter all the charts within the tile, and click on charts to highlight other visuals within the tile. Dashboards often contain tiles from many different sources, and sometimes the tiles can get out of sync with the latest data in the source datasets. Until now, if a tile wasn’t showing the latest data from the dataset, the dashboard owner would have to refresh each dataset one-by-one. With this release, you can now refresh all the tiles at the same time. From the top navigation bar on your dashboard, select the ellipses (…) and then Refresh Dashboard Tiles. This will refresh all the tiles on the dashboard with the latest data from the datasets. A couple weeks ago, we blogged about a great way to improve the look and usability of your reports: using images in tables, matrices, and cards. In this release we have taken this one-step further. You can now use images in slicers. 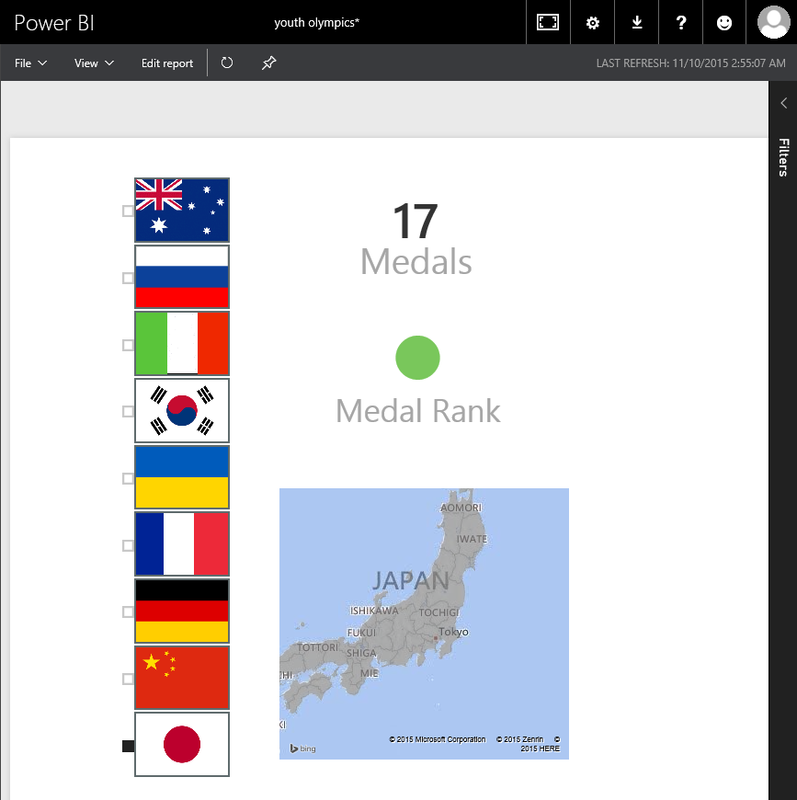 For a reminder of how to set up images in Power BI using Excel or the Power BI Desktop, check out our blog from a few weeks ago. Once images have been set up in your report, you can add them to a slicer and start filtering with them. And of course, they will work on pinned report tiles as well. Lastly, we want to tell you about the Visual Interactions feature. By default, when you filter or highlight a visual, it filters or highlights the other visuals on the report page. But what if you want to filter or highlight the visual and *not* have it impact other visuals? You now have a choice. To use this feature you must be in Editing View. Select a visual and choose Visual Interactions from the top navigation bar. All the other visuals will show icons that let you pick how that visual will react when the source visual is filtered or highlighted. Select Visual Interactions again to leave thismode. That’s all for this week. We hope that you enjoy this new update and continue sending us valuable feedback about our product. 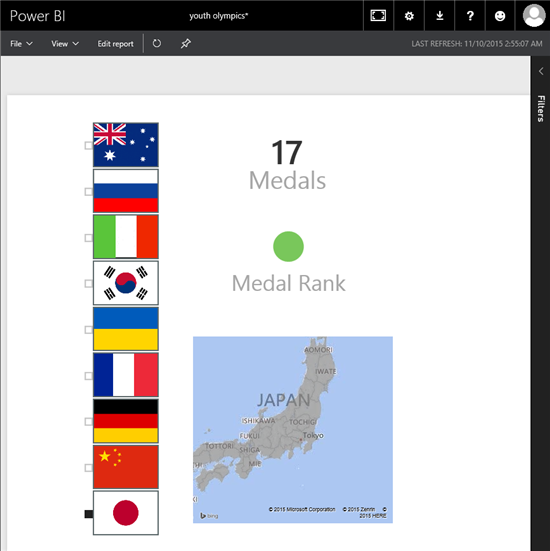 Please don’t forget to vote for other features that you would like to see in Power BI service in the future.